Related Events? - Archpaper.com Related Events? 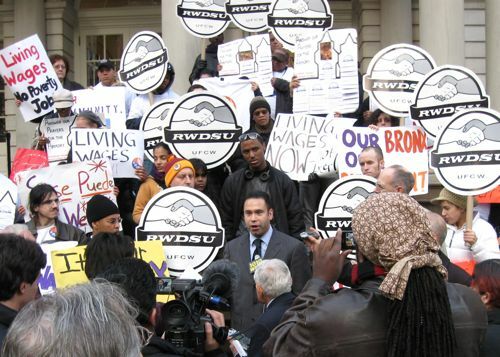 City Council member Joel Rivera leads a rally against the Related Companies Kingsbridge Armory project on Wednesday. Council speeker Christine Quinn has taken a quieter approach with that developer's Hudson Yards. With all the ink spilled of late on the Related Companies’ faltering plans to transform the massive Kingsbridge Armory into an equally huge mall, another of the developer’s megaprojects has been lost amidst the protests: Hudson Yards. As Bronx City Council member Joel Rivera has been leading a noisy fight against the armory, demanding a living wage for workers who will someday populate its stores and food courts, speaker Christine Quinn has been more quietly negotiating with Related on adding affordable housing to the western section of the outsiszed development planned for the Far West Side. On Wednesday, Rivera was prepared to lead a vote against Kingsbridge unless the developer met his demands—$10.00 per hour with benefits or $11.50 without—but the vote was cancelled at the last minute when stalled negotiations fired back up. Another vote had been scheduled for this morning, but that, too, was postponed until Monday, the drop-dead deadline for the council to act on either project. The Hudson Yards project is on the verge of passing the City Council, though the amount of affordable housing in the project remains to be seen.